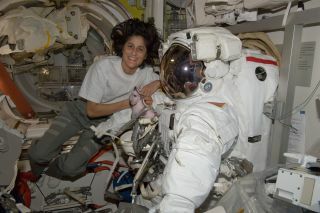 NASA astronaut Sunita Williams, Expedition 32 flight engineer and commander of the International Space Station's Expedition 33 crew, poses for a photo with her spacesuit ahead of an Aug. 30, 2012, spacewalk. NASA astronaut Sunita Williams, who holds the record for the longest spaceflight by a woman, took charge of the International Space Station Saturday (Sept. 15), becoming only the second female commander in the orbiting lab's 14-year history. Williams took charge of the space station from Russian cosmonaut Gennady Padalka, who is returning to Earth on Sunday after months commanding the outpost's six-person Expedition 32 crew. Williams launched to the station in July and will command its Expedition 33 crew before returning to Earth in November. "I would like to thank our [Expedition] 32 crewmates here who have taught us how to live and work in space, and of course to have a lot of fun up in space," Williams told Padalka during a change of command ceremony. She will officially take charge of the station on Sunday, after Padalka and two crewmates board their Soyuz spacecraft for the trip home. NASA astronaut Sunita Williams (front left) takes command of the International Space Station from cosmonaut Gennady Padalka (front right) during a ceremony marking the start of the Expedition 33 increment aboard the space station on Sept. 15, 2012. Padalka, NASA astronaut Joe Acaba and cosmonaut Sergei Revin are scheduled to undock from the space station Sunday at 7:09 p.m. EDT (2309 GMT) and land in the Central Asian steppes of Kazakhstan at 10:53 p.m. EDT (0253 on Sept. 17). The trio is wrapping up a five-month mission to the space station and Padalka thanked his crewmates and flight controllers on the ground for their help during the flight. Sunita Williams arrived at the space station on July 17 on a Soyuz spacecraft with two crewmates: Japanese astronaut Akihiko Hoshide and Russian cosmonaut Yuri Malenchenko. They will be joined by three new crewmembers in October. Williams, 46, is a captain in the U.S. Navy and flying on her second long-duration space mission. She first launched into space in 2007 and spent 195 consecutive days in space, setting a record for the longest single spaceflight by a female astronaut. On Wednesday (Sept. 19), she'll celebrate her birthday in space. In a NASA interview before launch, Williams said a friend asked her if she was nervous about commanding the space station. She said no, adding that the more than two years of training alongside her Expedition 32 and 33 crewmates, as well as the Mission Control team, prepared all the space station crewmembers for life in space. "When you get up on the space station, you know what to do, so I’m not nervous about it all," Williams said. "I’m psyched." The first female commander of the International Space Station was NASA astronaut Peggy Whitson, who commanded the orbiting lab's Expedition 16 mission between fall 2007 and spring 2008. Whitson later served as NASA's chief astronaut and recently stepped down from the post to rejoin the Astronaut Corps' spaceflying ranks. Two other female astronauts, Eileen Collins and Pam Melroy, commanded NASA space shuttles. Mission Control sent Williams a few words to mark her new role as space station skipper. "Congratulations on the promotion to your new position," a flight control told Williams after today's ceremony. "We know you'll run a fine ship up there." You can follow SPACE.com Managing Editor Tariq Malik on Twitter @tariqjmalik and SPACE.com on Twitter @Spacedotcom. We're also on Facebook & Google+.